Everything's coming up roses at Megan Leone Designs - Susan Said... WHAT?! Like other die-hard fans, I really enjoyed Idol Gives Back last week. This is definitely my favorite episode of the season every year! I think it’s wonderful that the creators of American Idol recognize their awesome power to reach millions and use that power to do some good in the world. Finding one for myself, however, did not prove easy. I lucked out when I discovered Megan Leone Designs . Since 2004, Megan has been creating her signature, one-of-a-kind, bracelet handbags crafted from vintage materials. 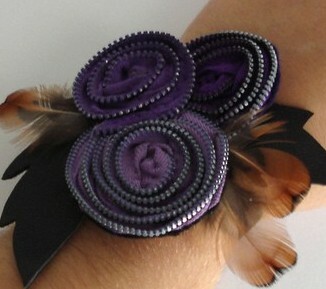 Now, in addition to her bracelet purses, she designs jewelry and modifies vintage clothing. 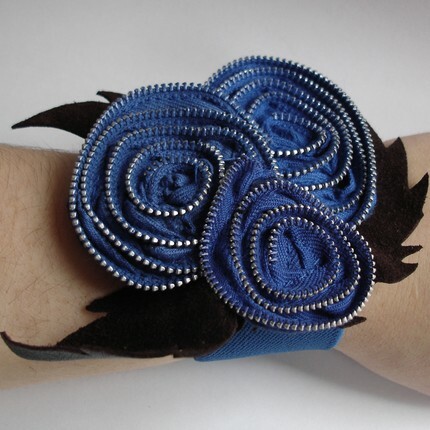 And, lucky for us, her “fashion from the ashes” design philosophy now includes wrist corsage made from recycled zippers, buttons, and more. Megan says that her corsages were inspired by her old design job years back at a flower shop. 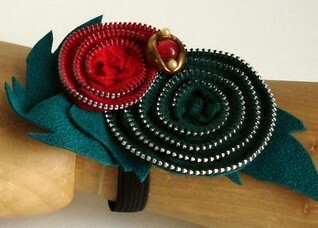 Only these adorable corsages will never shrivel and fade away! Wanna rock the look? Visit Megan Leone Designs. Separator image Posted in WOMEN'S FASHION and tagged with accessories, fashion, Megan Leone Designs, whimsy, WOMEN'S FASHION, wrist corsage, wrist corsage jewelry.